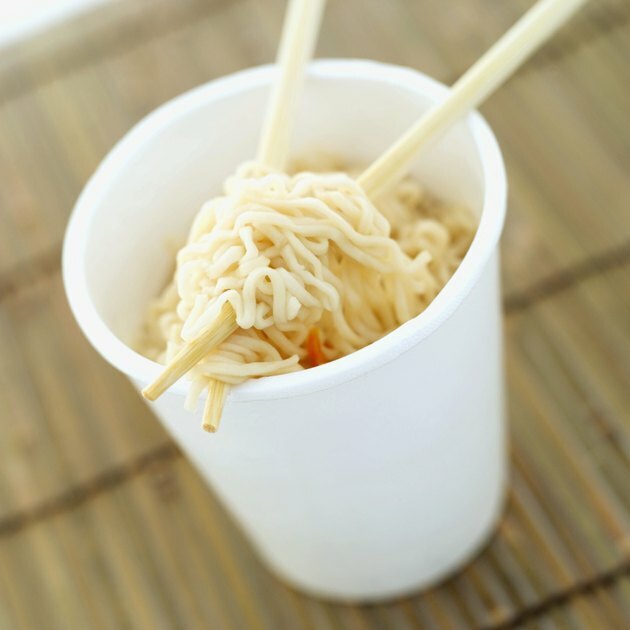 Cup O' Noodles, renamed Cup Noodles in 1993, was created by Nissin Foods and introduced to the marketplace in 1978. As a cheap and quick meal, Cup Noodles is a popular choice for college students. But with its high fat and sodium content, Cup Noodles may not make the healthiest food choice. Nissin Foods offers 10 different Cup Noodles flavors, including six different types of chicken flavors, three shrimp and one beef. Choices include Original Chicken and Beef flavors, Hearty Chicken, Salsa Picante Shrimp and Spicy Chile Chicken. Nutrition information for each of the different flavors varies. One container of Cup Noodles is considered one serving. Depending on the flavor, calories range from 280 to 330, with the Spicy Chile Chicken containing the fewest, and the Beef flavor containing the most calories. Cup Noodles are high in both total fat and saturated fat. One serving contains 12 to 15 g of total fat and 6 to 7 g of saturated fat, with the Spicy Chile Chicken containing the least amount of fat, and the Hearty Chicken the most. Consuming foods high in saturated fat can increase your blood cholesterol level, and increase your risk of heart disease. Paying attention to how much fat and saturated fat you consume throughout the day can help you limit your intake. On a 2,000-calorie diet, you should limit your total fat intake to 65 g a day, and saturated fat to less than 20 g a day. Most of the calories in Cup Noodles come from the carbohydrates. One serving contains 36 to 42 g of carbohydrates and 1 to 2 g of fiber. Carbohydrates in food provide your body with energy and should make up most of your daily calorie intake. A balanced diet should contain about 45 to 65 percent of its calories from carbohydrates, or about 225 to 325 g on a 2,000-calorie diet. One serving of Cup Noodles contains 6 to 8 g of protein. Beef flavor contains the most with 8 g, while most of the other flavors contain 6 g. Protein is an essential nutrient and should make up 10 to 35 percent of your daily calorie intake. Protein is used to make cells, preserve muscle and keep your immune system strong. Cup Noodles are very high in sodium. The sodium content ranges from 790 to 1,480 mg, with Hearty Chicken containing the lowest amount of sodium, and Chicken Vegetable the highest. Eating too many high sodium foods can increase your blood pressure. Try to limit your daily intake to less than 2,300 mg a day.